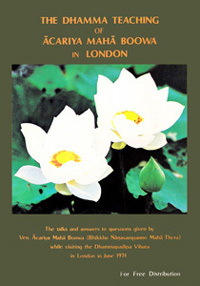 Talks and Answers to Questions given by Venerable Acariya Maha Boowa Nanasampanno while visiting London. The Venerable Acariya Maha Boowa Nanasampanno accepted an invitation to go to England in June 1974 together with two other Bhikkhus, Venerable Pannavaddho and Venerable Abhiceto, originally from the U.K. and Canada respectively. All three had the good fortune to be able to stay at the Dhammapadipa Vihara in Haverstock Hill which was run by the English Sangha Trust. It was there that Acariya Maha Boowa gave the talks recorded in this book, the only exception being the discussion on 13th June in the morning at Cambridge, when the Bhikkhus went to receive food at Mr. Benedic Wints house. The talks given by Acariya Maha Boowa were tape recorded, but the questions and answers were mostly taken down in shorthand by M.R. Sermsri Kasemsri. It is mainly due to her efforts, not only in taking down the questions and answers, but also in subsequently transcribing all the talks and her shorthand notes and typing out the manuscript, that the Thai book was produced from which this translation was made. Translation from Thai into English does not normally present any special problems. But the origin of this book was the spoken word; in addition, the subject matter is Dhamma, which involves many concepts and technical terms for which English has a rather poor vocabulary  and often a lack of the necessary fundamental concepts. The teachings of Buddhism may in fact be compared to a technical subject such as chemistry or electronics in that many technical terms and phrases are necessary. Special concepts and ways of thinking are needed in order to understand and appreciate the reasoning and truth of Buddhism. When it comes to a question of whether to translate a technical word (nearly always from the Pali language into English), the reasoning that has been used is as follows: If a word in Pali has a wellknown and accurate equivalent in English, then the English word is used (e.g., sati  mindfulness; pañña  wisdom). But if there is no well-known or accurate equivalent, or if the use of an English word leads to more confusion or misunderstanding than the original Pali word, then the Pali word is used (e.g., samadhi, jhana). I must apologise to those people who are not familiar with Pali terms and so find it difficult to read a book like this which has many Pali terms. But I feel sure that it is far better for readers to not understand rather than to misunderstand. In any case, following on this introduction is a short list of those Pali words that occur frequently in this book, together with a brief assessment of their meaning, so that the reader who is not familiar with those words can have a ready reference. There is also a more complete glossary at the end of the book. I should like to thank all those who have helped to produce this book, including M.R. Sermsri Kasemsri for her work on the original book in Thai; Mr. Michael Shameklis for his help in editing the translation of the first thirty or so pages; Bhikkhu Abhijato for helping to correct many translation mistakes; and to Bhikkhu Cittobhaso for typing out the manuscript. The complete Book contains 91 pages. Filesize is about 564 KB.